This book explores the forces reconfiguring local resource governance in Indonesia since 1998, drawing together original field research undertaken in a decade of dramatic political change. Case studies from across Indonesia’s diverse cultural and ecological landscapes focus on the most significant resource sectors – agriculture, fisheries, forestry, mining and tourism –providing a rare in-depth view of the dynamics shaping social and environmental outcomes in these varied contexts. Debates surrounding the ‘tragedy of the commons’ and environmental governance have focused on institutional considerations of how to craft resource management arrangements in order to further the policy objectives of economic efficiency, social equity and environmental sustainability. The studies in this volume reveal the complexity of resource security issues affecting local communities and user groups in Indonesia as they engage with wider institutional frameworks in a context driven simultaneously by decentralizing and globalizing forces. 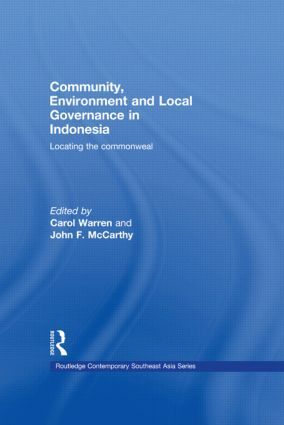 Through ground up investigations of how local groups with different cultural backgrounds and resource bases are responding to the greater autonomy afforded by Indonesia’s new political constellation, the authors appraise the prospects for rearticulating governance regimes toward a more equitable and sustainable ’commonweal’. This volume offers valuable insights into questions of import to scholars as well as policy-makers concerned with decentralized governance and sustainable resource management.